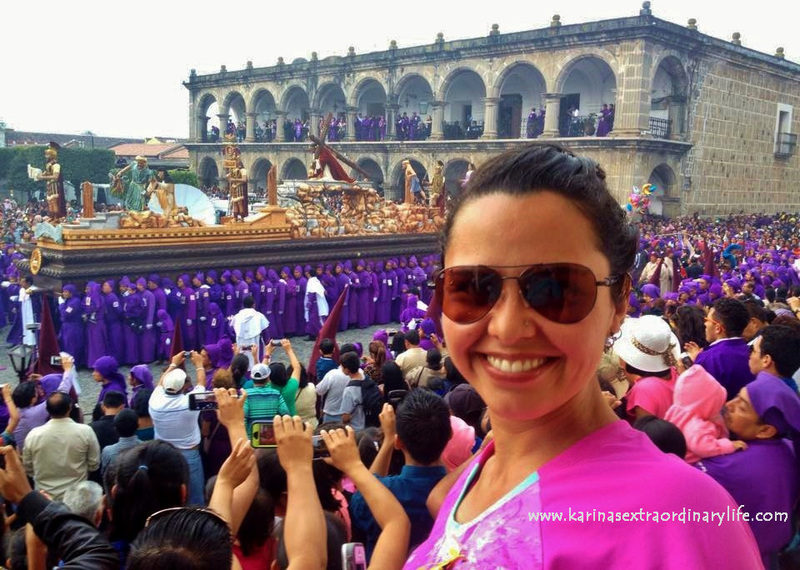 In the weeks leading up to Semana Santa, entrepreneurs from all over Guatemala have been eagerly anticipating the explosion of local and foreign tourism that occurs in Antigua every year during the Lent celebrations. As the population rises in Antigua with each passing day, vendors flock to the city in search of potential customers. With nothing but a small pile of charcoal, a rusty grill and a slab of cast-iron, women begin preparing food in the streets. Over open fire they make fresh tortillas, grilled meats, guacamole, rice and beat-salads which they market to passers-by from the side of the road. Observing the incredible resourcefulness of Guatemalans is nothing short of impressive. Small cash businesses seem to emerge overnight as vendors flood the streets marketing heaps of textiles, elaborate rosaries, small toy sized replicas of the cucuruchos, and of course, typical Guatemalan food and candy. When processions first emerge from the church, neighbouring streets are already filled with eager spectators awaiting the display. 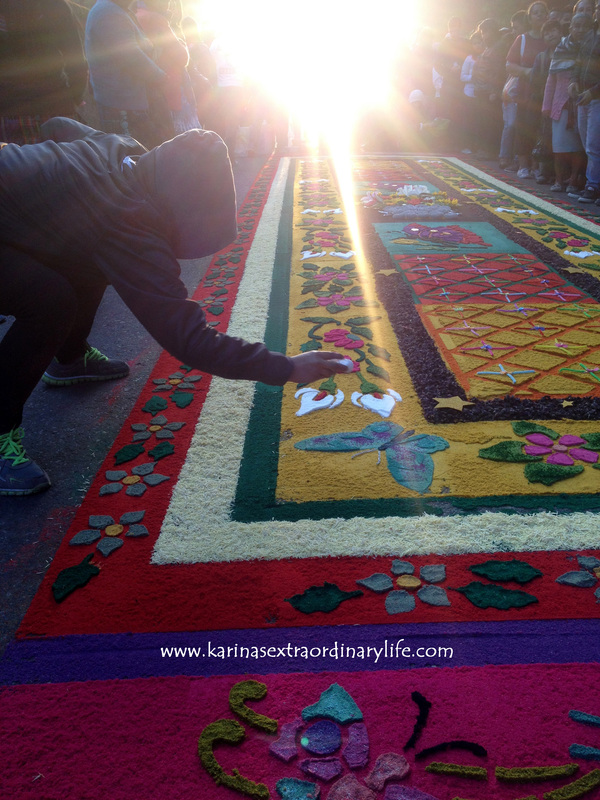 Many hungry families work through the entire night preparing their alfombra offerings. Commerce in the city is in full swing day and night. Locals pace the streets selling whatever products they are able to market and some of these items are often quite intriguing from a foreign tourists’ perspective. Among one of the more attention-grabbing products to suddenly appear on the market was a series of wooden carvings representing the face of Jesus Christ. Like nothing we had ever seen before! We curiously studied several women who arrived at their chosen destination with their entire kitchen strapped to their backs. Somehow, all on their own, they were able to lug with them a roasting pan AND a series of clay pots filled with pre-cooked food with the goal of creating a nomadic business. Sitting cross-legged on the curb, they spooned out delicious looking stewed meats into disposable bowls and charged their customers a reasonable price for each dish ( 10-15Q or $1.50-2). Travel Tip: If you plan to grab a snack from street vendors, make sure you have something smaller to work with than 100Q as it is difficult for them to make small change. Mangos are currently in season. You will see more women washing, peeling and seasoning the delicious fruit in one street here than there are Starbucks’ in Los Angeles, California. Tostadas, roasted corn on the cob, marshmallows dipped in chocolate, deep fried plantains and churros are also among some of the fantastic treats we highly recommend you consider trying! It is common in Guatemala to see Mayan women routinely transporting fruit, vegetables, baked goods and other items in an oversized basket that they effortlessly balanced on their heads around the city (while their baby sleeps soundly strapped to their back). Every single time I witness this unbelievable sight my jaw instantly drops to the floor in wonderment. Guatemalan people are incredible. Vendors seek out areas that are most congested with people, thereby concentrating near each velacion and of course, along the route of each procession. Pop-up vendors find a location they feel will best maximize their profits so when the procession eventually passes them by, they will pack up shop in a flash and relocate to get ahead of the crowd once again. Where possible, they will carry their entire store on their back so they can move with the pack. Being nomadic is the key to ensuring that this style of business is a successful enterprise! It was remarkable to watch tiny little businesses rise up out of thin air then disappear following the completion of each procession. From one minute to the next, a street would be bursting at the seams with people, then swiftly turn into a ghost town with only packs of hungry stray dogs rummaging through garbage cans looking for the scraps left behind. Given the fact that Holy Week has not officially begun, (it extends from March 29th-April 5th) I am looking forward to seeing the ongoing transformation of Antigua, Guatemala as this world renown event unfolds. Wow! this looks positively amazing! what are those purple robed ppl carrying there? some sort of float?